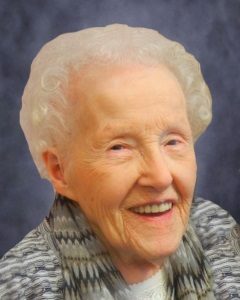 Lois Elsa Young, age 103, of Hutchinson, Minnesota, passed away on Sunday, April 14, 2019, at Lakeside Apartments and Assisted Living in Dassel. Memorial Service will be held Monday, April 22, 2019, at 11:00 A.M at Vineyard United Methodist Church in Hutchinson. Interment in the Oakland Cemetery. A Gathering of Family and Friends will be held one hour prior to the service at the church. Memorial preferred to Lakeside Apartments and Assisted Living in Dassel and Vineyard United Methodist Church. Lois Elsa Young was born on February 12, 1916, in St. Paul, Minnesota. She was the daughter of Richard and Josephine (Stark) Dahl. She was baptized as an infant on June 30, 1916, in Harris, Minnesota and confirmed in her faith as a youth on April 13, 1930, at Main Street Lutheran, now known as Faith Lutheran Church, in Hutchinson, Minnesota. She received her education in Hutchinson and was a graduate of Hutchinson High School class of 1934. Elsa attended at Hamline University in St. Paul for one year and completed a one-year secretarial training program at Behnke-Walker Business College in Portland, Oregon. In 1937, Elsa was united in marriage to Raymond Preston Seeley. This marriage was blessed with four children, David, William, Barbara, and Kathleen. They shared 15 years of marriage until the passing of Raymond in 1952. On March 26, 1960, Elsa was united in marriage to James Joseph Young. Elsa and James resided in Hutchinson, Minnesota. They shared 2 years of marriage until the passing of James in 1963. Prior to having children, Elsa held a variety of secretarial positions. She returned to the workforce in the 1950s as a secretary in the Hutchinson Public Schools. In 1956, she was employed by Minnesota Mining and Manufacturing. During her 25 years at 3M, she held a variety of positions, retiring in 1981, as Assistant Personnel Manager. Elsa had a green thumb and had a passion for flower gardening. She also enjoyed reading and playing cards; she cherished spending time with her family, and friends. She was active in the American Legion Auxiliary, 8 & 40, and Hutchinson Hospital Auxiliary. She was also a board member of the Hutchinson Planning Commission, Business & Professional Women, and Bear Lake Sunshine Society. Elsa was committed to community service, including delivering Meals on Wheels into her late 80’s and being involved in the Senior Ombudsman Program until age 90. Elsa was a longtime member of the Vineyard United Methodist Church in Hutchinson. Elsa is preceded in death by her Parents, Richard, and Josephine Dahl; First Husband, Raymond Seeley, Second Husband, James Young; Children, David Allen Seeley, William Scott Seeley; Brother, Dr. James Curtis Dahl; Brother-in-Law, Loy Young and his wife, Jan. I have very fond memories of Elsa from my days at 3M. Especially my very first day of orientation. Elsa became a good friend. She will missed. We always enjoyed having Elsa in our office-great conversations and a cheerful, grateful personality. She will definitely be missed. Our condolences to the family. I had many great memories of Elsa from Vineyard Methodist Church. She was a bright and engaging member of a number of committees on which we served together.. She was a great lady! She will certainly be missed. Elsa and I shared many good times and I will greatly miss our chats. Elsa was responsible for hiring me at 3M and I will always be grateful. She was a wonderful mentor and truly lived life to the fullest! My condolences to the family at this time of loss. I hope all the wonderful memories help to ease your grief.